Hayden Run Falls, originally uploaded by Tom Arbour. Wow, Megan and I have a weekend together, at home, in Columbus for the first time in six weekends! There really is no place like home, and yesterday, after I got off work a bit early, I went to Hayden Run Falls on the west side of Columbus. I've always wanted to photograph these falls, and with the thunderstorms and rain showers that rolled through yesterday, I had a perfect opportunity. What is amazing about this little gorge, which is owned and managed by the City of Columbus Recreation & Parks department, is that a busy road lies up and to the right, and gigantic mansions sit just above the gorge to the left. 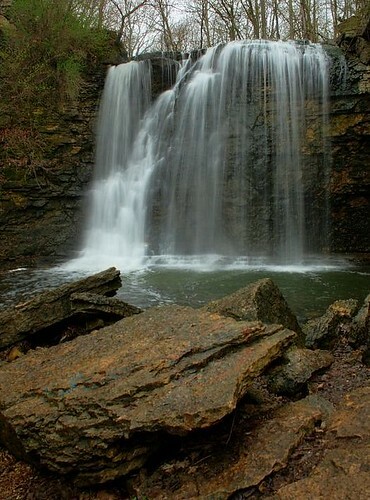 It is awesome that this waterfall still exists as an urban wonder in the city of Columbus. The short gorge ends in Griggs Reservoir just behind me, created by damming the Scioto River. Be sure to stop back tomorrow for a more artistic interpretation of this geologic gem. That is a great picture. It is hard to believe that that has survived this long in the city! Kris- Thank you. Yes, it is hard to believe. There are little bits of trash here and there in the stream- I had to be careful to hide those behind rocks and things, and the gorge has plenty of non-native invasive species. But it is still fairly amazing. Jennifer- Hmm...Well, I've done the work already, but you may have inspired me to do more! I guess you'll just have to see what happens. Also- Very good to hear that everything went well with your G.B. Love this one! So beautiful! Geologic gem indeed! A beautiful picture. Tom - what the heck kind of rock is that? It looks platey, like a slate or something, but the texture and color are pretty funky. I bet there are some "soil type specific" plants popping around in there! This is really beautiful, Tom! That waterfall looks so inviting. I look forward to seeing your next post! What a beautiful waterfall and a surprise to know it is in an urban area. Will be looking forward to the art interpretation. A beautiful photo, Tom. The falls are grand, but the colors on those rocks are fantastic. Looking forward to your interpretation. WOW Wow Wow... this is stunning. I am amazed by this photo... beautiful! Incredible falls and to be so accessible is a bonus! Very nice. That's a lovely photo indeed! Perfect shutter speed to cotton-candy-ize the water, but not too much. Tom: What a great little nature palce. It is a great place to get a nice photo.